Start-up company Five Elements Robotics yesterday launched a Kickstarter campaign for its flagship product, the Budgee follow-me robot. The robot, which was first shown at the RoboBusiness conference in October, is designed to improve the shopping experience for consumers by following them around and carrying their things, up to 50 pounds. It’s kind of a (much) simpler, less rugged, friendlier-looking version of Boston Dynamics’ mule-like Legged Squad Support System. The campaign’s goal is to raise $100,000 by Feb. 1, which the company says will allow it to produce the first Budgees to be shipped. The minimum pledge required to receive one of the first-generation Budgees is $1,299, or $100 less than the price advertised on the company’s website. 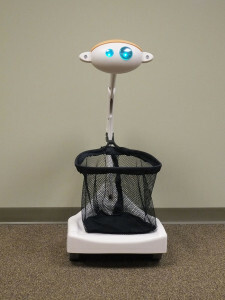 Budgee uses sonar and ZigBee to follow a transmitter that users wear facing the robot. The Five Elements team recommends using the robot to haul items around the mall, at an amusement park, or to and from the office. It’s relatively easy to transport, since it weighs less than 20 pounds and folds to fit into a standard car trunk. It should last through a typical day of shopping — battery life is estimated to be about six to eight hours. Five Elements was launched by Wendy Roberts, who also founded software firm Future Skies. The new company’s mission is to “revolutionize” the human-robot relationship. To that end, they have also developed a waiter robot and a research robot.